Me and healthy are not words that go together very well, as Kay will attest. But I've certainly been trying to eat a little healthier every day. This quinoa (pronounced keen-wah) salad is everything I like in a salad. Quinoa is, what foodies would call an ancient grain. Not only is it packed full of protein, but, according to Wikipedia, it contains 'contains a balanced set of essential amino acids for humans, making it a complete protein source, unusual among plant foods' I've talked at length about how I struggle to get more protein into Aditi, especially as she doesn't eat meat, and now refuses to eat fish as well. I first came across this salad when I did the butter chicken live blog session. Knowing that I probably wouldn't have any time to do a salad, I asked my friend Addie to bring one. He brought this one, and I loved it so much, I had to try and recreate it. Addie very kindly gave me the recipe. I modified it a bit, as I didn't have a few things and I also added a few more child friendly elements (read, raisins, amazing what a raisin or two can do for the 'tryability' of a dish). I also used my homemade Madras curry powder, rather than the generic one called for. The end result was so good, that this is a dish that is going to be on our everyday menu a fair amount. Who said healthy eating means boring? This salad has amazingly great flavour. Spicy, tangy, sweet and nutty, it encompasses everything, and each bite elicits a flavour packed taste sensation. I absolutely adore the Indian elements of this salad, and it appeals to my whole ethnic-local approach. Its quick to put together, and I love the fact that it can be adapted to pretty much anything you have in the cupboard. Eating a little healthier just got a little more easier! Rinse the quinoa and place in a pot. Add the hot stock and curry powder, and let it simmer on a medium low heat for about 15 – 17 minutes, until all the stock is absorbed. Let it stand, covered for another 5 minutes. Make the dressing. Place the lemon juice in a small bowl. Heat the oil in a small pan on a medium heat, and add the mustard, cumin and fennel seeds. When the mustard seeds start spluttering, take off the heat and add the chilli powder, Madras curry powder and ground cumin and let the spices toast together for about 45 seconds – 1 minute. Pour the hot oil mixture into the lemon juice, and whisk together until the dressing homogenises. Add about ½ tsp salt or to taste. Keep aside. Place the cooked quinoa in a bowl, and add the chickpeas, diced tomato, diced onion, raisins and fresh coriander. Stir together. Stir in the dressing. Taste and adjust seasoning. Serve just warm or cold. · You can add any kind of beans to the salad. · You could also add other vegetables like diced carrots, celery, peppers or mushrooms to the salad to bulk it out a bit. · Feel free to use a little extra lemon juice, if you like your salad quite tangy. Quinoa is a GF powerhouse. One of our friends has a condition called ciliac's disease; quinoa is one of his favorite 'pasta' alternatives. We've had it several ways at his house and have been pleasantly surprised every time! I'm going to pass this salad on to him! he'll love it! Thanks Deanna, my feelings exactly. Susan, a close friend of mine has coeliac's as well. I was surprised though how easy it is to make gluten free food. In a way we are lucky, because a lot of Indian food is naturally GF. I hope your friend enjoys this salad, we loved it. U read my mind Mich! I had only heard about Quinoa, but have never tasted it..saw it recently in a gourmet store, but its expensive here, so I thought it was best to have a reliable recipe ready before I buy it. How many people does this quantity serve? Your salad looks lovely, I am definetely going to try it! Shireen, its definitely a must for people trying to eat healthier. This recipe serves 2 - 3 people as a main course, will probably serve 4 - 5 easily as a side dish. Quinoa isn't cheap here either, but I buy from health food stores, and its a little cheaper. 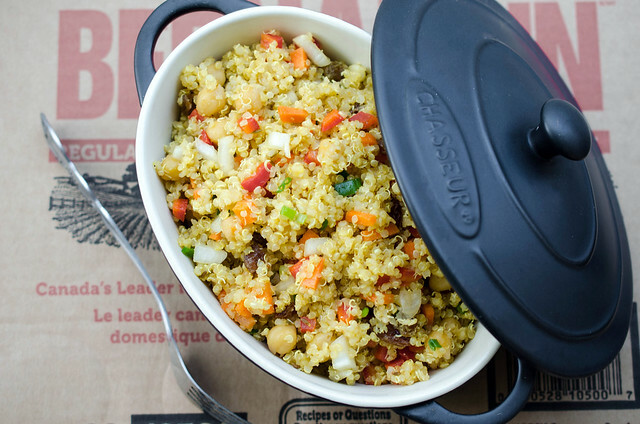 Thanks for this recipe for Indian style lemony quinoa and chickpea salad. It sounds like a nice, healthy dish. For a significant number of years, quinoa has been one of the grains that certain Native Americans have been farming, harvesting and eating even before many have appreciated it these days. 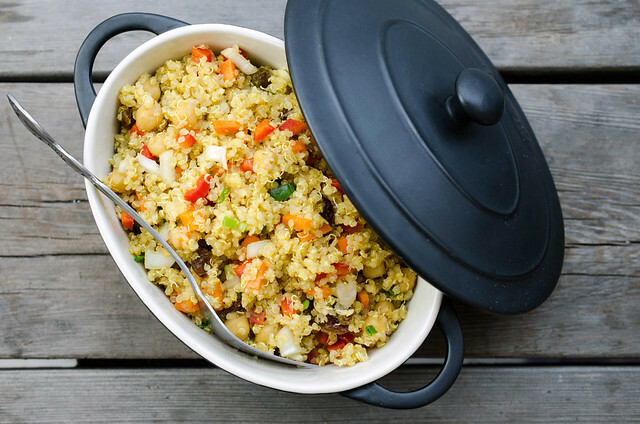 As a catering Fort Lauderdale service provider, we agree that quinoa is a healthy choice and mixing it with particular ingredients can be one recipe that can be beneficial to our health like this good dish presented here.